Another great weekend of football in the Blackpool and District Youth Football League saw Kirkham Juniors Reds extend their lead at the top of the U13s’ division. They had a 4-0 win over Blackpool Rangers Tangerines with goals from Jonathan Bennison, Tom Watmough and Liam Geraghty (2). Wyre Juniors were too strong for FC Rangers, winning 5-2 with Connor Ashton (4) and Dylan Copeland on target while Harry Liddle and Dylan Taylor netted for Rangers; see pages 24-25 for a full report. Warton Typhoons played St Anne’s Diamonds for a place in the Under-13s’ Hogan Plate final. A very tight match saw both teams play some excellent football and create chance after chance at both ends. The final whistle ended with the scores level at 3-3 and the match going to penalties where both keepers made some great saves. However, it was Warton who eventually claimed victory to set up a final against Wyre Juniors next week. 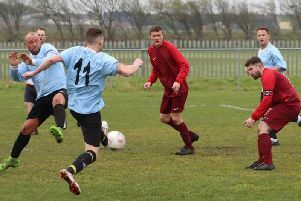 The second Under-14s’ Hogan Cup semi-final featured Squires Gate and Poulton FC. Gate played some lovely football and set up a final against Foxhall Juniors thanks to goals from Dan Fryer (6), Imaan Hussain (5) and Kobe Gregory. In the league there was a match of the Blues with Kirkham Juniors Blues hosting Lytham Juniors Blues and taking the points with a 5-2 win. On Thursday, Thornton Cleveleys Whites and Kirkham Juniors Blues met at Burn Naze, where they drew 2-2 with Thornton’s goals scored by Leo Duffy and Jaydn Walsh. Clifton Rangers’ Under-18s remained top with a 5-1 win over Staining Juniors thanks to Jack Arrowsmith, Jake Dennehy, Alfie Tomlinson and Finley Clarkson (2). AFC Blackpool were too strong for Kirkham JFC, winning 9-2 with their goals from Dean Glover, Kyle Pilling, Callum Gellatly (3) and two each for Ross Hart and Kieran Whitehouse; Anthony Wilding and Luke Swan scored for Kirkham. Foxhall Hoops edged home 3-2 against a Blackpool Rangers who had beaten FC Rangers 5-0 on Thursday. YMCA clinched a place in the Coulton Plate final with this hard earned victory at a sunny Seafield Road last Saturday. They had the edge in the first half and created plenty of chances as strikes from Thomas Dilkes and Nathan Ogden gave them a 2-1 lead at the interval. With a stiff breeze behind them Clifton came much more into the game in the second half with some determined attacking play. However, YMCA defended resolutely and kept their goal intact until the final whistle. YMCA’s season came to an end with this Coulton Cup semi-final defeat at Thornton last Sunday. The first half was evenly contested with both teams creating opportunities. Thornton took their chances better, however, and duly scored twice to take a 2-0 lead into the break. Thornton gradually took control of the game after the restart and added further five goals. The outstanding Callum Muir, who produced a tireless display throughout, netted a late consolation for YMCA with a delightful chip over the keeper from close range. YMCA had to be content with a point at Preston last Sunday. They started the game brightly and were first to the ball and dominant in possession. They took the lead in the fourth minute after Honey Griffith played a pass to Annabelle Jackson on the right-hand side and her expert delivery found Isabelle Kells to give them a 1-0 lead. They soon doubled the lead after a throw-in from Ellie McNally caused havoc in the home defence and Kells was on hand again to score from close range. Things got better for YMCA as goalkeeper Ellie Etheridge played a quick pass to McNally. She strode forward and played an excellent ball to Kells who finished with aplomb to complete her hat-trick. The home side began to come more into the game and they duly caught YMCA out from a corner to pull a goal back. Lostock followed this up with two more goals to cancel out the excellent work by YMCA and the half ended level at 3-3. After the break the home side piled on more pressure and took the lead for the first time of the match. YMCA, though, responded well, and inspired by the outstanding Griffith, they got their just rewards when a cross from McNally was turned into her own goal by the home defender to make it 4-4. Although YMCA pressed hard for a winner a point apiece was a fair result in the end to a thoroughly entertaining contest.